Since becoming president in 2016, Duterte has repeatedly attempted to reach a peace deal with the CPP, issuing several ceasefires intended as a gesture of goodwill. The communists have rejected his advances, leading to an announcement last year that he would instead create a special police unit appointed to find, disarm, and kill violent communist terrorists. While attacking the communist ideology at home, Duterte has struggled to convince Filipinos to accept an alliance with the world’s largest communist country, China. During his speech Tuesday, he claimed that China had rejected communism, despite being ruled by an official Communist Party whose radical atheist leaders have place tens of thousands of people in internment camps for their faith. He went on to imply that the idea of a communist leader controlling the Philippine government, or successfully running a government at all, was ludicrous and not worth any more loss of life because the Party was woefully unpopular. It is unclear which election in China Duterte referred to. Taiwan, a sovereign nation China claims as its own, does hold democratic elections, as does the independently managed Hong Kong. China holds elections within it legislature, the “National People’s Congress,” in which only government-approved “legislators” can serve. Its latest “election,” in 2018, resulted in Xi Jinping winning re-election as president with 100 percent of the vote. Duterte has repeatedly stated that he hopes to have more positive relations with China even as the Chinese government illegally colonizes Philippine territory in the South China Sea. He has also suggested the Philippines abandon its longtime alliance with the United States and instead seek to create a “new world order” with China and Russia. Duterte offered to send ten communists to China to show them what communism looks like in the 21st century. “I will ask soldiers to fetch in you field and you will be given passport. We will ask for a visa and then you go and tour China and tell me straight in the face whether the ideology is still right, the way that it’s being fought,” he challenged. 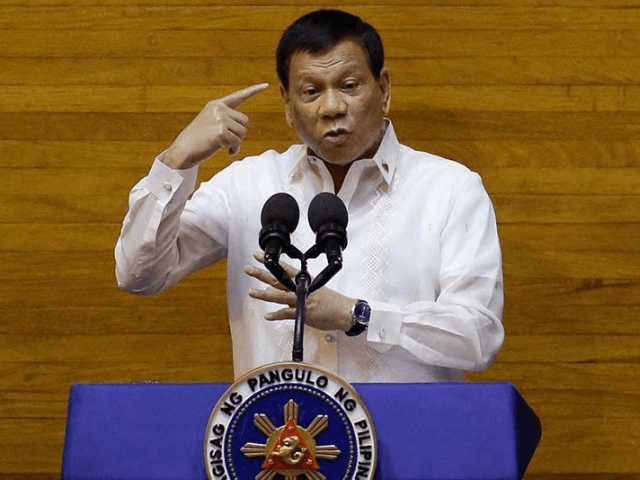 His latest remarks are Duterte’s latest attempt to end the over half-century old violent struggle the Communist Party has waged against the Philippine government, often targeting civilians and demanding opaque political changes to the government. In 2016, Duterte attempted a ceasefire with the group, abruptly canceling it when CPP members insisted on targeting and killing police. Duterte attempted a second failed ceasefire for Christmas 2017, hoping for a “similar gesture of goodwill” from the communists that never arrived. Most recently, Duterte announced the creation of a special “Duterte death squad” to target and kill CPP members.